dian - your new site is just lovely to browse thru, you are soooo talented and i get enormous pleasure just looking at the latest pics, especially of my beautiful grandchildren. Marieke - Mission accomplished! I can see why you are so happy with it. Your new site is everything you wanted it to be. Congrats!! Trevor - Well what a mission it was, but it was well worth it. It looks fantastic, keeping in line with your eye for a great photo..
nicole akhurst - WOW..Nicole. Your branding, blog and gorgeous details by far reflect such a brand spanking new side of you. I LOVE IT. It IS fun & fresh and Erika has done a brilliant job on your logo.I just adore how you have connected each of the elements, colours and emotion of your brand across the board. Its stunning and I wish you all the very best for your new endeavour with your three little munchkins that grace your biz now. Love these kinds of designs – they are so not me, and not my work but sometimes I wish they were just coz they are so cute!!! Katie Toland - you know i juist adore it nicole. i live erikas work. i cant believe you and i were so similar with our lady bugs and then this style. I just love it all, blog looks fantastic. Melody G - LOVE IT!!!! Looks awesome Nic! And “so you”. Keep up the awesome work babe! Jenny Ruddle - Awesome Nic, love it colours awesome too!! Kristi James - Absolutely adorable! I love love love it!!! Kim Selby - I LOVE these!! Fantastic. Narrelle - Oh I do love this. So fun and fresh, and inviting. LOVE the header too – FAB job! Donna Phillips - Fantastic work Nicole, I love the logo and colours, it works so well. Natalie - I just love your new website. It is amazing. You really are talented!! Love it. Hannah - These are really gorgeous, Nicole. I love it – so fresh and fun and seems really representative of you and your work. Yum! Christine Pobke - Whoo hoo! Congrats on the new site + logo! LOVE it! I love how happy and adorable the family is! 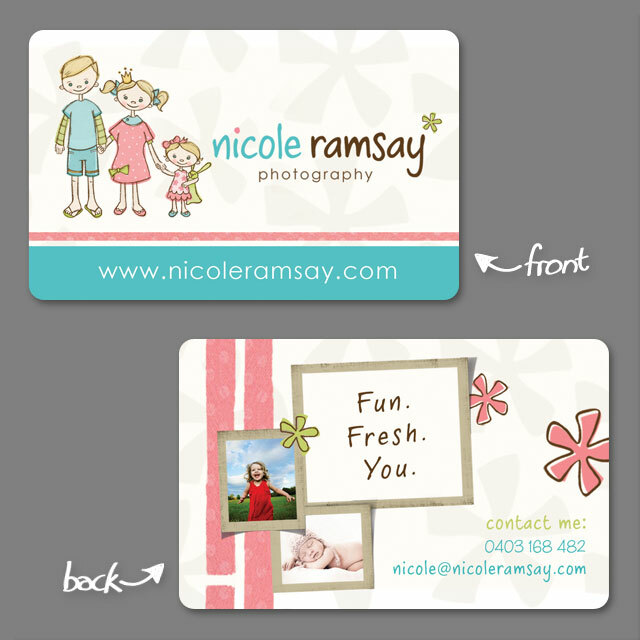 And how cute are your new cards??! Bekie Marie - B.E.A.U.T.I.F.U.L. So fun & fresh… perfect!!! Melanie - Your branding is adorable, I think you accomplished your mission. Robyn Geering - It’s awesome Nicole, you should be so proud of yourself. A beautiful place to showcase your beautiful work.